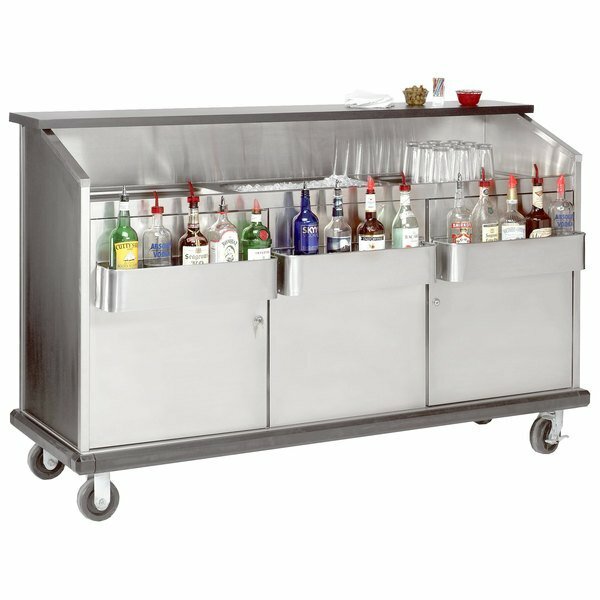 Take your beverage service on-the-go with this Advance Tabco AMD-5B heavy-duty portable bar with stainless steel interior. Designed for high volume use, this versatile unit boasts a 19" x 13 1/2" x 11" insulated ice bin complete with drain and shut-off valve. Full perimeter bumpers serve to protect walls and furniture, while the all stainless steel interior allows for easy cleaning and sanitizing. A 12" mica laminate bar top with black finish provides a professional, polished look. Two speed rails match the stainless steel interior and can accommodate up to five standard-sized liquor bottles each. Three doors open to reveal a practical storage space for glass racks, bar towels, and more. For added convenience, transportation is effortless thanks to a total of four 5" heavy-duty swivel casters, two of which include brakes. Perfect for busy catering operations and more, this Advance Tabco AMD-5B portable bar contains everything you need to establish an award-winning drink service at any location. Front to Back: 13 1/2"